Department of Biological Sciences, Redeemer’s University, Mowe, Ogun State, Nigeria. Due to the renewed interest in medicinal plants research resulting from the resistance of malarial parasites as well as antibiotics to known drugs, this study was carried out to document the different medicinal plants used by the indigenes of Ogii in Okigwe, Imo State Nigeria to treat different ailments which complements orthodox medicine which is expensive and not readily available. Information on these plants were readily available with the older generation, hence the need to gather and document these data as soon as possible and also highlight the need for the conservation of plant resources. The different plants were collected during field trips in July and November 2008 as well as April and December 2009. A total of seventy three species mostly trees and shrubs belonging to thirty eight families and sixty eight genera were found useful to the people for curing different human diseases as well as other purposes. The most diverse families were Euphorbiaceae, Annonaceae and Fabaceae with seven genera for the former and six each for the other two. Members of the Annonaceae appeared the commonest species used in malarial treatment suggesting the presence of antiplasmodial substances in this family and the need to extract and characterize such for posterity. The survey was carried out using a structured questionnaire administered to local herbalists (ethnomedicinal practitioners) as well as some elderly men and women. The information provided in this paper included the botanical names, local names, family names, life forms, and parts of the plants used for medicinal purposes. Most of the plants were already known. The dried, pressed, and mounted specimens were deposited in the temporary herbarium of the Redeemer’s University after proper authentication by Mr. B.O. Daramola and Mr. T. Odewo at the University of Lagos Herbarium. 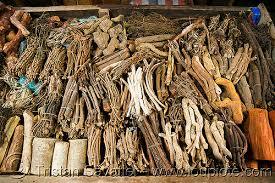 Keywords: ethnobotany, antiplasmodial, medicinal plants, malaria, Ogii.